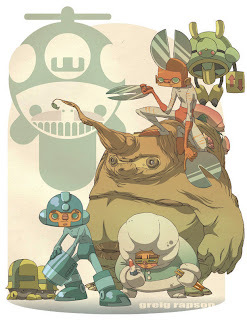 This is the piece that appears in the Mega Man tribute book from Udon Ent. It was a lot of fun to play with the characters that took up so many hours of my childhood! That's so beautiful... I couldn't think of a more different (from the original) charadesing than yours, but it looks absolutely amazing. drend - awesome man, thanks! Matteo - Thanks a lot, I'm glad you dig it!